The Learning Bridge stands apart with a large campus, a range of enrichment activities, and all-organic meals that can flex to accommodate dietary needs and allergies. Child-safe, poured soft-surface bike track with tricycles for one, two and three riders! 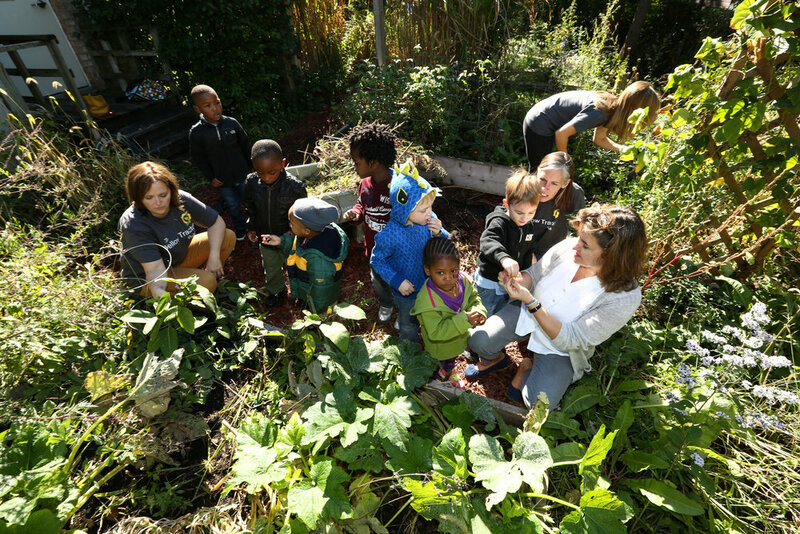 Gardening teaches children to work cooperatively in groups, learn about science and nutrition, and create art and stories inspired by plants and flowers. Good nutrition follows naturally! The whole school goes outside together twice a day, weather permitting. This allows classrooms to mingle, brothers and sisters to visit, and teachers and students to get to know one another. If the weather keeps us indoors, children work on gross motor skills as they tumble, balance, jump, climb, and dance through our basement recreational room and indoor obstacle course. We will work with you to accommodate your family and child's dietary needs. Reading Art -We are fortunate for the expertise of Lindy Rubin, who brings us ‘Reading Art’ to shows and discuss great works of art with the Center’s children. The teachers and Ms. Lindy work together to create ongoing classroom projects around the paintings presented. This program culminates in a field trip to the Art Institute to see the paintings and sculptures in situ. Jumpstart - A national early education organization that recruits and trains college students interested in serving at-risk preschool children growing up in low-income homes. Our Northwestern University Jumpstart team provides hundreds of hours of support to help children develop the language and literacy skills that support kindergarten readiness. Dental Hygiene - Two resources support Center children’s dental hygiene: Dr. Richard Vogel visits the school to talk about teeth and their care, leaving behind a generous supply of toothpaste! We also schedule Universal Smiles each year to conduct routine teeth cleaning and fluoride treatments for young children. Police Reading Program- Working in partnership with the Evanston Police Department, we are piloting a program where police officers in uniform visit the school and read to our students. As students laugh and have fun with these men and women, they also build trust and familiarity with the work they do in our community. Evanston Public Library and Book Buddies -Laura Antolin, an Evanston Public Library community outreach liaison (and Board member) visits our classroom once a month with stories for the children. Ms. Laura also engages regular volunteers through the Book Buddies program to read stories and assist with art projects in our classrooms. Sunshine Circles® social emotional learning -No Hurts, Stick Together and Have Fun! are the three rules of the Sunshine Circles program brought to us by our consultant Chava Alpert and the staff at Theraplay. Sunshine Circles are structured activities that strengthen empathy, compassion, and cooperation. These foundational skills directly support the social, emotional and even cognitive development of children at the Center. Music Therapy -Ben Crabtree is a music instructor and play therapist. Every month, he brings his guitar and spends time in every classroom. The children love Mr. Ben and the songs he teaches them! CATCH -The CATCH curriculum focuses on physical development, nutrition, and good health. Lessons help teachers and children explore exercise equipment and activities, and discuss where food comes from and how to grow it. Occupational Therapy -Barb Lyons is a retired Occupational Therapist who visits the Center every week to help children improve skills for daily living activities. Kindergarten Transition Program -During the summer we hold two “Kindergarten“ sessions for children who need some extra help preparing for school, such as confidence in their letter sounds or better self-regulation. Swimming -At the end of July, the children in the 3-5 year old classrooms go to the YWCA for swimming lessons. This is possible in part through grant underwriting and donor support. Field Trips - The children visit neighborhood parks, and go on walks to nearby entities like the post office and bakery. We also schedule annual field trips to children’s museums and other cultural institutions.